John Brier, CEO. Email JBrier (at) TinBu (dot com). John Brier serves as the CEO and President of TinBu. John has a B.S. in Business from the University of Maine and an M.B.A. from Thomas College . He was a founder and the COO of Broadcast America, an internet broadcasting group that became the largest internet broadcaster in the world in the late 1990's, and has previously served as President of Softec Online, Inc., an online marketing company that generated multiple millions of dollars in revenue under his direction. John has also served as Executive Director of a New England based Big Brothers Big Sisters agency, and he has served as an officer in the U.S. Army and in the Massachusetts National Guard. Jim Schonewolf, VP of Global Sales . Email JSchonewolf (at) TinBu (dot com). Jim is a 1991 Graduate of Penn State University earning a B.S. in Business Administration. Prior to joining TinBu Jim worked for over 9 years as a director of online content sales with The Sports Network, a leading supplier of real time sports information. Jim has over a decade of experience marketing online and wireless content to leading media groups around the globe. Lee Eckley, Canadian Sales Director. 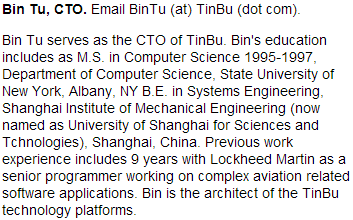 Email Lee(at) TinBu (dot com). Lee brings a unique skill set to the TinBu family. He is a long time radio broadcaster and fixture on Toronto airwave's since 1978, working at CFNY, Q107, CHUM FM and CHFI. Lee markets the TinBu content platform in Canada, working with Canadian online publishers interested in partnering with TinBu.